Chicken Curry in the 400 g ring pull can. The finished products are gently prepared by a manufacturer with the best ingredients. 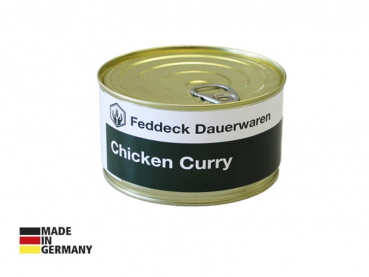 The Feddeck ready meals from the can are very tasty and immediately to consume. Heat the can in the water or add the contents into a pot and enjoy. By means of a special manufacturing process, this finished product has a very long shelf life even at room temperature. Ingredients: 61 % Chicken breast fillet, drinking water, wheat flour, onions, cream, whole milk, stone salt, pepper, sugar, potato flour.